Popping for Parkinson’s is a dance project created by Simone Sistarelli, who holds a BA in contemporary dance from Trinity Laban Conservatoire of Music and Dance, London, UK. 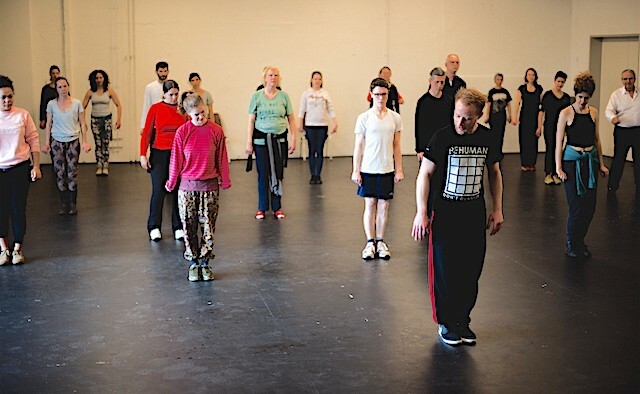 The programme teaches body popping dance techniques to younger people with Parkinson’s. All classes are free of charge. How did you get into body popping? When I first started dance classes as a child, I just found that body popping was the best way to express myself – hip-hop as a culture is all about expressing yourself. But, the one technique that I felt better with was popping, so I just kept on doing that. And then I went to study contemporary dance at Trinity Laban here in London. What made you realise that popping could help people with Parkinson’s? Well my late Granddad had Parkinson’s, so I have a personal connection to the condition. Almost six years ago, I went to see the Candoco Dance Company – a company of disabled and non-disabled dancers – they just blew my mind. It was amazing to see all these different physicalities dancing. I realised that I wanted dance to not just inspire people, but to do something for the community. And then I remembered that with Parkinson’s, the muscles are already contracting and releasing. So, what might happen if I taught people with Parkinson’s to control the contracting and releasing of muscles, as in body popping dance styles? I believe that learning these skills will make the student feel better. But also thanks to neuro-prosthesis, it will help create new connections in the brain, so they are relearning how to move, their patterns and their habits. So, this is something that I believe that is there – it is just not scientifically proven as yet, but I’m hoping that people would like to conduct research soon. What kinds of people attend your popping classes? Do you have people with Parkinson’s and without Parkinson’s in the same class? The class itself is designed for people with Parkinson’s. In terms of the actual students I have, it varies, because it’s an open class – in theory anyone can come and take a class – you don’t have to have Parkinson’s. Usually the attendees I get are younger people with the condition. 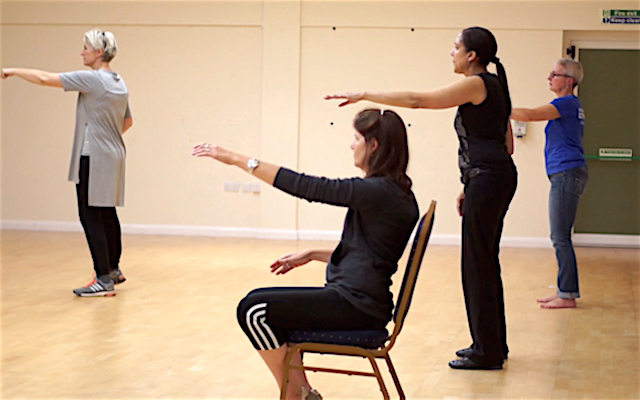 Often, the people with Parkinson’s that come to my dance class bring their kids, or their partner, or friend or carer. Anyone can come and dance. And it’s great because when the dance students i.e. the people who actually have Parkinson’s, are in the class, they almost forget that they have Parkinson’s. Most of my students come regularly, so when someone new comes in and they are beginners, the people with Parkinson’s can see the progress they have made. It’s so rewarding for them. I often take videos of our classes to just share with the students so they can see the progress. In two years they’ve made big changes in the way they dance. How important is it to have exercise options like this, that appeal to those with young-onset Parkinson’s? That’s absolutely relevant because all of my students have tried many other options – in terms of exercise classes and dance classes, but also in terms of general activities – swimming, to yoga and Tai Chi. Obviously it is very personal as to what types of exercise suit different people. All of my students seem to be younger people. Most of them have told me that they found other specialised Parkinson’s classes “too gentle” and “boring”. What kind of music do you dance to in the classes? We mainly listen to hip-hop as this is the music that dancers have traditionally done body popping to – in the same way you would go to a ballet class and listen to classical music. But that doesn’t mean we only play hip-hop – often my students will say “Oh, you know what, I really want to dance to this tune today” and we’ll just put it in the mix. Where and when do your classes take place? Are there any plans to expand to other areas? Regular Popping for Parkinson’s classes are in Wimbledon, London, UK, every Monday evening at 7pm and are free of charge. We’ll be restarting classes on Monday 4 September. Do you look to people like David Leventhal – the Dance for PD programme director – to see where Popping for Parkinson’s could be in 10 years? Yes, and he’s such a great guy. He supports me and helps me with a few things. Knowing that someone like him is on my side is great, because it validates what I’m doing. Popping for Parkinson’s is quite a specific project so it’s not that easy to transfer the knowledge to someone else. The main problem for me is to find people who already have a good knowledge of popping who are interested in community dance and, specifically, dance for people with Parkinson’s. What advice do you have for people with Parkinson’s who are looking to try a new form of exercise to help with symptoms? Just get involved! It doesn’t even have to be dance classes or any exercise. The biggest problems that I see with my students and the people in the network that I collaborate with, is that most of them struggle to get out and do stuff. It can be easier said than done sometimes, but I’m open and willing to travel, teach and give workshops. It would be lovely for people who are interested to learn more about it. I’m ready to Pop for Parkinson’s… Whatever gets you out in the community and gets you moving! I’m 79 y.o. and i have been diagnosed with P D since 2008. Although I have been classified STAGE 3 I keep optimistic practicing physicall therapy,. occupational therapy , writting and reading.i believe in the power of our brain and also n the advancement of research for the complete cure of PD.